Sea turtles' reality is very different than the fun-loving, playful way they're depicted in popular movies such as "Finding Nemo." 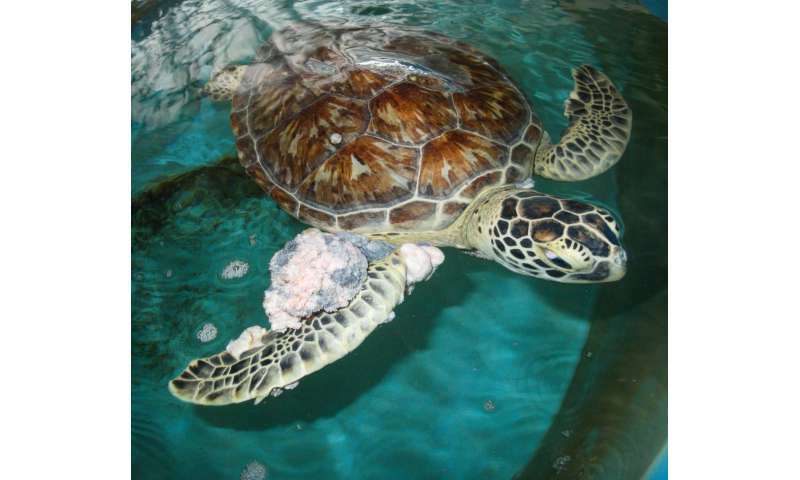 Far from being carefree, sea turtles across the globe are heavily burdened by debilitating soft-tissue tumors. All seven species of sea turtle found in the Earth's oceans are classified as vulnerable, endangered or critically endangered – and they're all affected by these tumors. They inhibit the animals' vision, feeding and movement. Combined with other human-caused environmental problems, the growths threaten sea turtles' very existence. 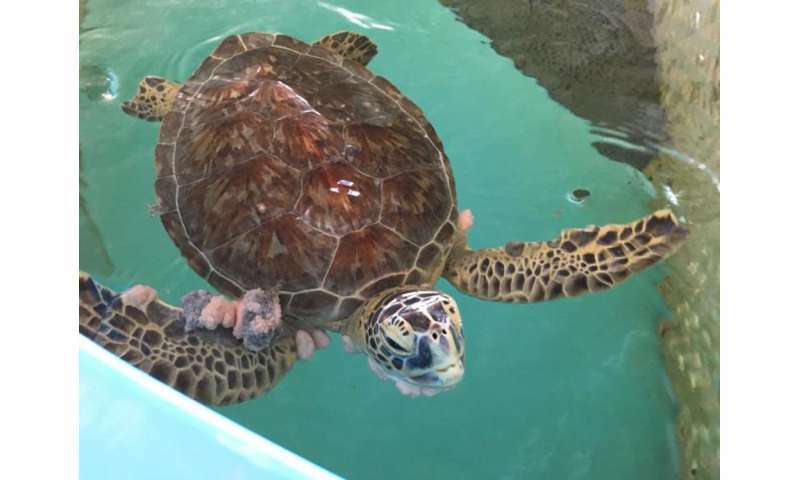 My colleagues and I at the University of Florida's Whitney Laboratory and Sea Turtle Hospital are turning to recent technological advances and novel genetic and therapeutic applications to try to untangle how this disease works. Some of our best insights are coming from using the tools of human oncology and precision medicine. Hopefully we'll ultimately halt the disease's global takeover and help the sea turtles afflicted in the wild. Are particular body locations more susceptible to tumor development? Body parts subject to the most prolific fibropapillomatosis tumor growth include the eyes – affecting turtles' ability to see and survive in the wild – and the soft, vulnerable underside of the shell. How quickly do tumors grow in different body parts? We've found that ocular tumors regrow significantly faster than tumors located on other parts of the turtle anatomy. How does surgical removal affect the turtle tumors? 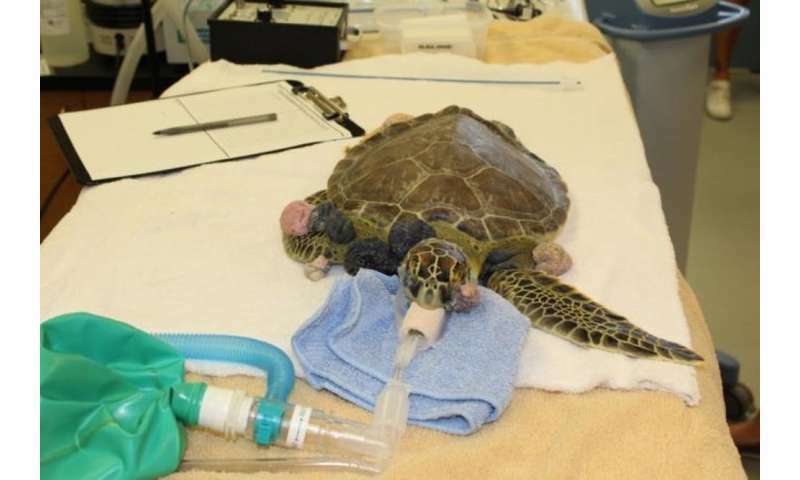 Even after multiple rounds of tumor-removal surgery using a cauterizing carbon dioxide laser, persistent tumor regrowth is a recurring problem in infected sea turtles. We've found that, on average, 60 percent of rehabilitating turtle tumors regrow within 36 days. We'd expect true regrowth rates over a prolonged period in the wild, however, to be much more severe. Underlying genetic features could be part of what drives these tumors to grow back again and again. Now that we've filled in some of this baseline data, we want to target the genetic factors that are responsible for accelerating tumor growth. The goal is to optimize targeted therapeutics that can be tested for effectiveness in sea turtles that end up in our hospital. That's just what my colleague David Duffy is doing by applying precision medicine-based approaches that combine an individual's specific genes, environment and lifestyle to optimize the efficacy and therapeutic benefit of their medical care. He's profiled fibropapillomatosis tumor tissue that's been surgically removed by laser resection as part of rehabilitation. Then it's possible to compare the genes that are expressed in tumor tissue to those in biopsies from non-tumor areas of the same turtle. By examining the viral genes in the herpes virus as well as the turtle genes associated with tumor growth, he's gained vital insight into the nature and triggers of the disease. 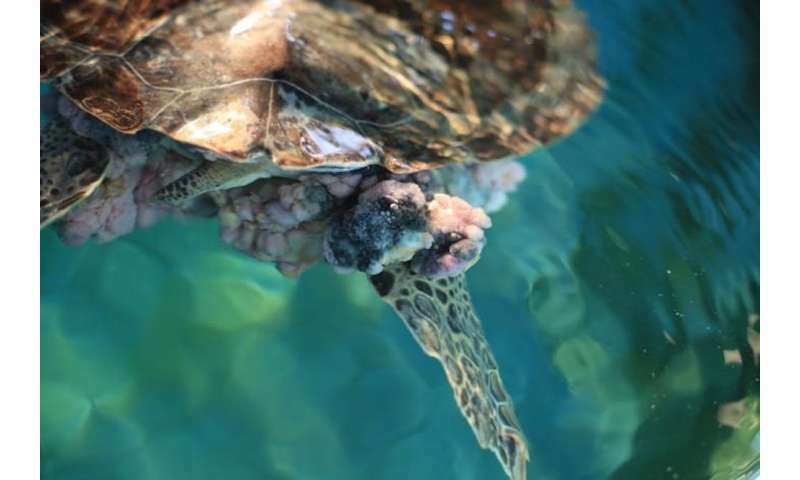 The Turtle Hospital on Marathon Key and the University of Florida's Sea Turtle Hospital, working closely together, have used human anti-cancer drug treatments such as fluorouracil to decrease post-surgical recurrence of eye tumors in sea turtles. With continuing research into the nature and triggers of the disease, though, we hope to shed light on why this naturally occurring disease has spiraled out of control. The more we know about fibropapillomatosis – its genetics, how it's transmitted, how it metastasizes throughout the body, and what environmental co-factors are exacerbating its spread and severity – the more we can put the pieces of the puzzle together to devise a solution for wild sea turtle populations. With genomic and environmental analyses indicating that human-induced changes are driving disease emergence in sea turtles and other wildlife species, it's only fair that human beings share some of their disease treatments with these animals.